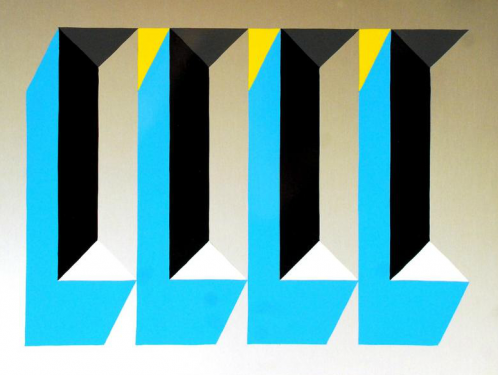 From today on, Joshua Liner Gallery celebrates the opening of the ICY Sign Shop with the exhibition, Perfection is Standard, Mistakes Cost Extra, featuring the skills of Justin Green, Matt Wright, Lew Blum, Dan Murphy, Alexis Ross, Sean Barton, Mike Lee and our former interviewee Stephen Powers. This group of sign painters and artists have previously set up shop at the Coney Island boardwalk, on the streets of Johannesburg, and in the parking lot of the Los Angeles Museum of Contemporary Art, among other likely and unlikely locations around the world. Joshua Liner Gallery is now hosting the most recent iteration of the shop for its return to Manhattan. 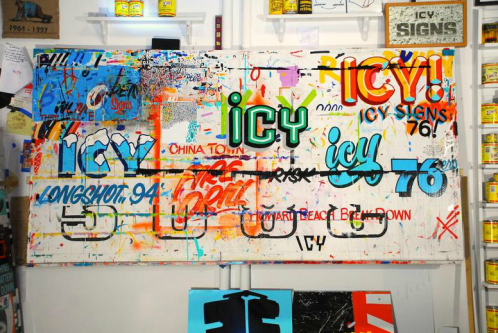 ICY Signs converts the gallery into a workspace, hanging sign benches, setting up paint tables, and filling the walls with signs, as well as their own work, which draws on the vocabulary of traditional sign painting. During the course of the show, the space accrues paint splatters, palleting marks, full ashtrays, empty pizza boxes and other detritus of the working process—hallmarks of a proper sign shop. The Chelsea shop is an active workspace, with the ICY mechanics creating works in real time in the weeks following the opening. At its current location, 72 Fourth Avenue in Brooklyn, the ICY shop produces signs for local businesses and serves as an open studio where passersby are invited to enter and witness the painting process first-hand. Beginning on October 24th, the opening of ICY Signs Chelsea will increase the reach of the ICY project, bringing hand-painted signage to a new neighborhood with the input and blessing of local residents.